I'm very lucky to have another masterclass with Bob Nudd. Big thanks to my good lady Jo who bought me this surprise present. This would be my second time out with Bob. Bob called me well in advance to discuss what I'd like to do for the day. 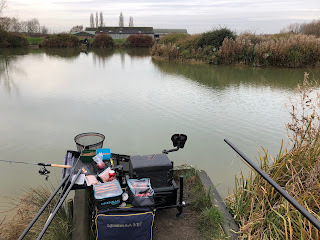 First option was going to be a river somewhere as I tend to mainly fish commercial venues my other option was to learn to fish a big natural water fishing at distance using braid for big bream. So the day was set and the location agreed upon was Gunwade Lake, Ferry Meadows in Peterborough. I called my fishing buddy Mark up to see if he wanted to come along too which was very timely as he'd just had a day with Bob and his father in-law. We met Bob in the car park and took our gear down to Pegs 39 and 40 so not too long a walk. Set-Up - Rods and Reels Big casts, heavy rigs need substantial gear. I was using a 13 foot Daiwa Tournament RS Feeder rod coupled with a Daiwa Cast'izm 25 QDA loaded with guru Pulse 8 braid.